Would you still choose timber over PVC? When it comes to decking most people instantly think of wood. Wood is the traditional material that has been used for years, it’s economic, it’s durable but most of all it is readily available and easy to use. Consumers know that wood needs to be looked after but often don’t realise until it’s too late how much care it really needs. In addition to the seasonal clean it also needs treating and staining to keep it looking good. This, however, doesn’t prevent rot, this comes from underneath the decking where there is little light, lots of warmth and lots of untreatable areas making it a haven for all things moss and mould. AB Sundecks have a range of deckboards that contain no wood elements at all, these form part of our siganture range and what AB Sundecks pride themselves on. Each standard or bespoke design is built on a siganture steel sub frame which eradicates the ‘rot from beneath’ process. We then complete the project with either our exclusive PVC range of deck boards or our oaks or aged weatherboards - both of which are completely free from any wood elements but have that natural aesthetic of a traditional wood grain. The PVC deck range has a distinct wood grain effect which matures over time leaving a beautiful finish. The great thing about this product is its self extinguishing and anti slip properties. This product is widely used across the UK on holiday homes and lodges. Our aged and oaked weatherboards add character and style to any project creating an area of timeless beauty. Taken from hand-picked wood samples the distinctive colours go hand in hand with our range of hand rail finishes. These deck boards are the popular choice for gardens, holiday homes, commercial and public spaces. The woodland range is new to the family, perfect for gardens, patios, and pool areas as it is much more durable than timber. It is waterproof, splinter free and slip resistant making it the obvious choice for your home. Composite decking is a timber alternative made up of 60% timber content. 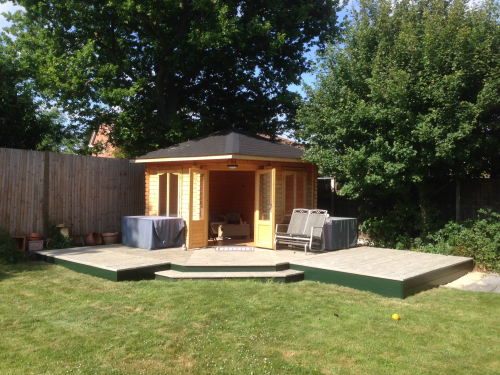 All AB Sundecks come with a 10 year structural guarantee and as they are built on galvanised steel sub frame they can be added to, extended or repositioned at any time.